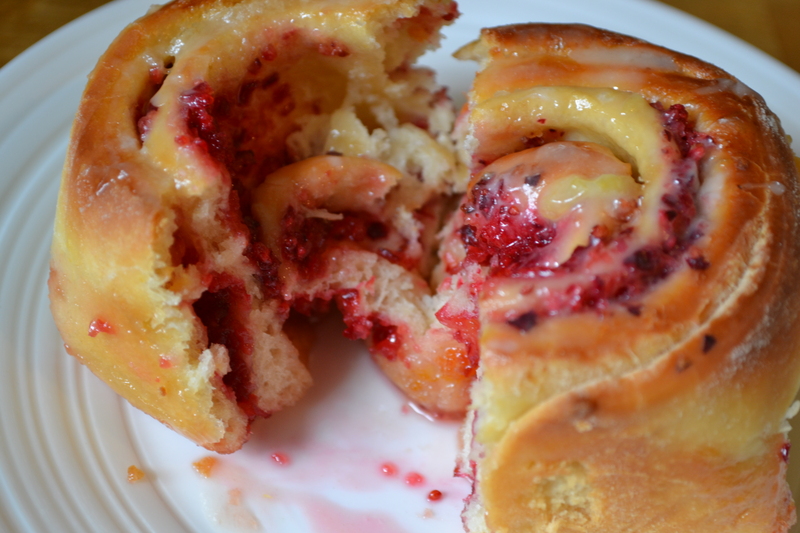 As soon as I spotted the Smitten Kitchen‘s Cranberry and Orange Breakfast Buns post I knew they had to be made. They looked so delicious and I could almost smell them coming through my screen. Unfortunately it’s taken me an entire month to get around to making them. What an error. If have had made them immediately I could have been enjoying them weekly for an extra month of my life. The reality was even better I’d imagined. They tasted sublime. 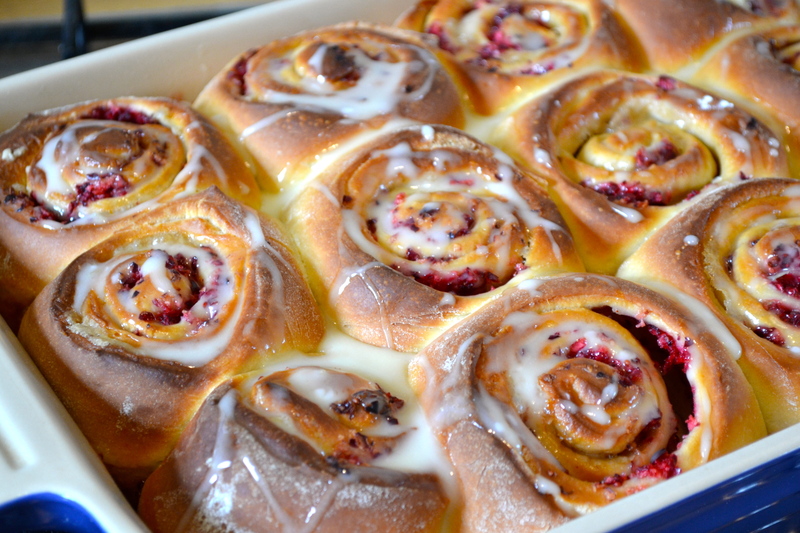 The combination of orange and cranberries nestled inside swirls of enriched dough really is too good to turn down. And the best thing about the recipe? (Other than it’s complete and utter deliciousness of course) The fact that you can make the buns the night before and bake them the following morning resulting in freshly baked breakfast buns. Yes, freshly baked! After no preparation at all that morning! You’ll know by now that I’m a breakfast fiend, but not even I am willing to get up almost 3 hours early on a Sunday in order to produce freshly baked goods for breakfast. But with this recipe, once you’ve prepared the buns, they get to rise magically into fluffy swirly buns overnight in the fridge. You just have to take them out of the fridge 30 minutes before you want to bake them. A perfect moment for the phrase: “here’s something I prepared earlier”. Enjoy! PS Due to the appearance of the festive combination of cranberries and oranges in this recipe, I’ve deemed it fit for the Perky Christmas Series. I am, in fact, in the process of convincing my family that these would be a great way to kick of Christmas day. Mmm, one of these with a Buck’s Fizz. Divine. I’ll let you know how I get on! 1. Put the flour, yeast, salt, and sugar in the bowl of your stand mixer with the dough hook attached. In a separate bowl/jug, mix together the eggs, buttermilk, 3/4 of the orange zest and melted butter. Pour the liquids into the stand mixer bowl and mix everything together on a slow speed for 5-7 minutes. The resulting dough should be soft and smooth and not overly sticky. If you don’t have a stand mixer, stir everything together with a wooden spoon vigorously until it comes together into a ball then knead on a floured surface for 5-10 minutes until smooth and soft. 2. Scrape the dough into a large oiled bowl and cover in cling film. Leave to rise at room temperature until doubled in size. This can take up to 2.5 hours. 3. Meanwhile prepare the filling. Melt the butter and set aside. 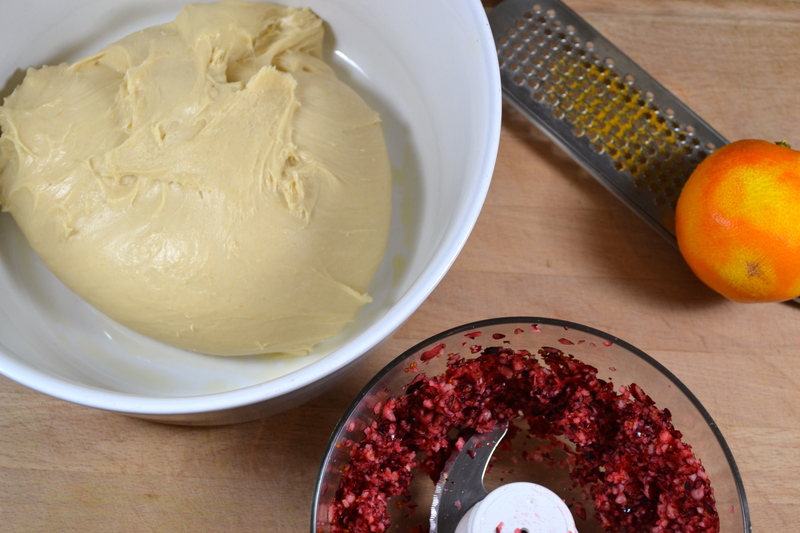 Put the cranberries into a food processor and blitz to a coarse rubble (not fully pureed) – scrape the sides down a couple of times to make sure you get them all. 4. To assemble the buns once your dough has risen, first butter a dish that is about 20cm x 30cm. Then turn your dough out onto a floured surface and roll it out into a rectangle about 42cm by 30cm. Brush the dough with melted butter, scatter it liberally all over with the brown sugar and then follow with the cranberries and remaining orange zest. 5. Roll the dough into a tight, 42cm long roll and then cut the dough into 12 sections, about 3.5cm each. You’ll need to saw through the dough gently to prevent the rolls being squashed as you cut through them. Arrange the rolls with their spiral sides facing up in the buttered dish. Cover with cling film and refrigerate overnight or for 16 hours max. 6. The next morning, take the buns out of the fridge 30 minutes before you want to bake them to allow them to warm up a little. 7. Preheat your oven to 180°c/160°c fan/gas mark 4 and bake for 30 minutes until puffed and golden. 8. Remove from the oven and leave to cool in the dish. Make the icing by stirring together the orange juice and the icing sugar then drizzle over the buns. Serve immediately. Oh my goodness, these look divine. 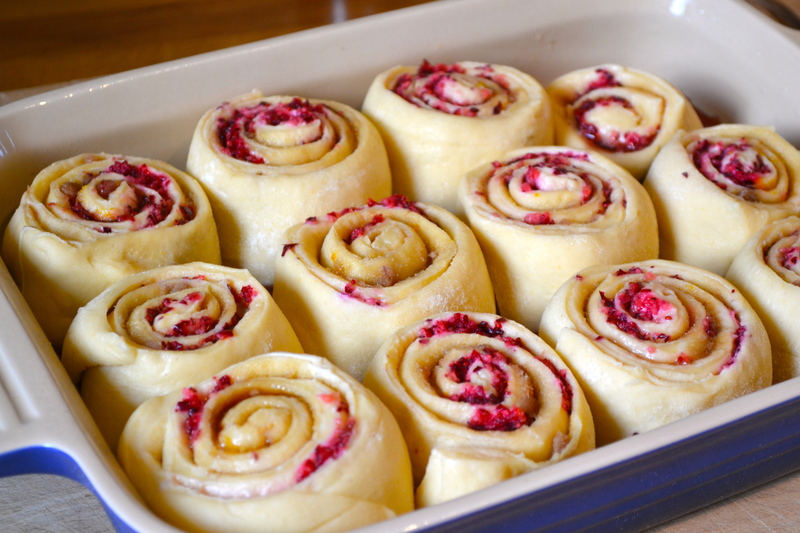 I LOVE cranberry and orange in anything, and like you said, nestled in fluffy soft dough? Um, YES. Need to make these! I’ve just spotted your post on Cranberry Orange Shortbread cookies! They look divine – cranberry and orange is just such a great combination.